Looking for great ways to inspire high school kids this year? These 15 motivational ted talks for students would definitely help! Not only are they a staple in the sphere of learning but also an incredible way to help kids around you. Ted talks are motivational. They help people grow, shine and become better people. Also since the speakers are professional, they know what exactly needs to be told in order to help others develop their chance and prosper even more. Whether you are looking for a way to inspire kids to do their homework on time or finish a new project, these are some of the people you should definitely rely on! 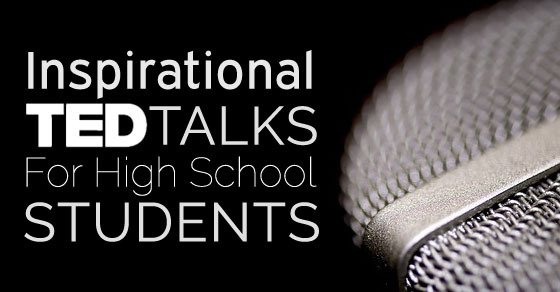 Following mentioned are few inspirational ted talks for high school students. If we speak of the best Ted talks all over the world, then Viktor Frankl would be one of those people who will impress you like no other. This guy is an absolute genius. He is a philosopher, psychiatrist and also a Holocaust survivor. In this, he also explored the youth’s universal quest for more meaning. It should also be a message for those who are currently caught up with their cultural and temporal boundaries and are looking for inspiration to motivate and work on themselves. They have also offered some really nourishing and intelligent bits of info to work to learn from. One of the most important things you could ever teach a high school kid is the importance of time. Time management skills are very much important for them as they are young and when you teach children something when they are small, they tend to build on that. So help them out a bit with this amazing ted talk brought to you by Philip Zimbardo. This guys lecture will certainly change the way you think. He will help you with the past and the present and also give you great advice on the future. Whether it comes to your health or even productivity, Philip is always on top of his game. Another great thing you can always teach high school kids is how to take charge. Kiran Bir Sethi who happens to be a founder of India’s Riverside School can really help you with this. She has not only changed her community in the past few years with so much positivity but also continues to do the same. She is a positive person, a very healthy one and someone who can help your kids improve their grades. So trust her when it comes to helping kids! Ben Kacyra is for all those teachers who go through a tough time while trying to teach their kids some history. Lessons on architecture, humanities and arts are pretty hard to do these days and people often need help from someone to work on the depictions of Pompeii and Babylon. They have also discussed how the educators have shown interest in the parties and are able to find even more structure that he and his wife have created for the several academic applications for this new kind of exciting technology. So if you want to give the kids some new advice on history and architecture, make them watch this! Charlie Todd has spoken about the experience of absurdity. Since the year of 2001, ‘Improv Everywhere‘, which happens to be a company is working with New Yorkers along with their performances that are whimsical and come with pranks that are harmless. Charlie Todd has also spoken about how you can participate in order to display more humor and absurdity which encourages more interpersonal connections and even more importantly are able to promote the value of smiles and bits of laughter in order to enjoy life. Shukla Bose who happens to the founder of Parikrma Humanity Foundation once said that you will have to go deep into the economically depressed sections of the country and provide kids with such great educational opportunities so that they can enjoy some of their basic rights as people. Maths, engineering and art were one of the best astounding and creative demonstrations that were ever to be seen in Robert Lang’s speech. This guy is an absolute professional and genius and has really cool tricks up his sleeve. He has helped in turning paper squares into nicely detailed frogs, guitarists, grizzly bears and many other phenomenal sculptures, some of which you can really boast on and can also be very much aesthetic in nature. Adam Savage showed us some really simple methodologies which gave two really exciting and scientific discoveries of all time. Eratosthenes and his calculations on circumference and the measurement of Hippolyte on the speed of light was also discussed by him. Adam Savage is a fun loving person who will make learning and science much simpler for you. He will advice you on what you really need to reach the top and give you hope. Larry Lessig is also another famous speaker you must let your students listen to. He happens to have the best videos of all times and also gives you great ideas on creativity. Those who want to pursue law in the future should definitely listen to him. Larry happens to be a very popular lawyer who gives you compelling and interesting stories on how blogging works. There are some really great ideas that you can pick from here. Maurice Ashley who happens to be a grandmaster at chess speaks from the TED Youth of 2012, he shared this one method that anyone can use in order to work on his game and improve it. David Kelly helps you in creating and boosting confidence. He uses the TED talk in order to argue that nobody should ever be asking themselves that question whether they should fit into a certain category. He also says that people everywhere in the world have the potential to create something beautiful and memorable. This brings the post to an end. If you have liked watching this inspirational video TED talks for high school students and would like to give us some feedback, please feel free to comment in the box below. We would love to hear from you. Always remember that these things matter and if you teach your kids something wonderful, they will always remember you for it. Also if you have any questions regarding motivational talks to high school students post, kindly let us know that as well. We are waiting to hear from you. On that note, good luck!